It could be said that artist Robert Maniscalco works in the family business. Like his father — renowned portrait painter Joseph Maniscalco — he’s a portrait painter. And following in his father’s footsteps, he’s painting new generations of families that his father, and even he, painted years ago. A retrospective of some of Robert Maniscalco’s many portraits over the last 27 years will be on display April 2-27 at University Liggett School in Grosse Pointe Woods. 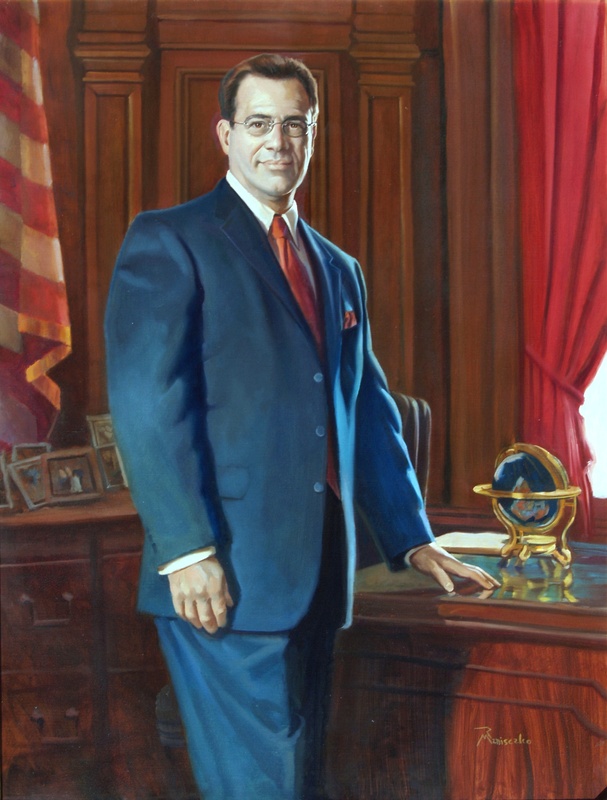 The show includes the public debut of a portrait of Wayne County Executive Robert Ficano, one of Maniscalco’s more recent works. Besides well-known figures such as Ficano, Michigan Council of the Arts founder E. Ray Scott, Oakland County Executive L. Brooks Patterson, TV star Chris Noth and news anchor Carmen Harlan, Maniscalco has painted thousands of other portraits. Maniscalco is a “high-quality, classic painter,” said Jim Pujdowski, the Liggett gallery coordinator and an art instructor at the Middle and Upper School. The youngest of four children, Maniscalco grew up in St. Clair Shores and opened an art gallery that bore his name on Detroit’s east side. He later moved the gallery, and his own address, to Grosse Pointe City. Two years ago, he and his artist and framer wife, Amanda, and their toddler son, Danny, closed the gallery and moved to South Carolina. Although he’s been back to create portraits and give talks, this is Maniscalco’s first solo show since he left Michigan in May 2005. In his new home, Maniscalco has also started a series of “low country” paintings in natural settings. About 25 portraits — on loan from their subjects — will be displayed at Liggett. The artist is also giving a talk to students. An exhibit of portraits by Robert Maniscalco is on display April 2-27 at University Liggett School, 1045 Cook Road, in Grosse Pointe Woods. The gallery — in the Manoogian Arts Wing — is open during regular school hours, 8:30 a.m.-3 p.m. Monday through Friday. The school will be closed April 6 and 9 for the Easter holiday. For more information, visit www.uls.org or www.maniscalcogallery.com.